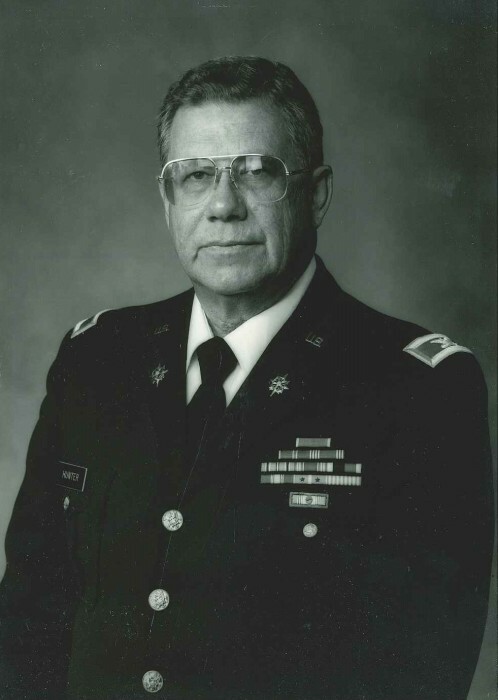 Officer, gentleman, scholar, David H. Hunter, Ph.D., retired Colonel U.S. Army, died November 3rd 2018 at the age of 91. He is survived by his loving wife of 63 years, Mary; daughter Ramona Hunter Duffey; grandchildren Haley, Paul and Rachel Duffey, all of Athens, GA. His sister Dorian Hunter of Fullerton, CA preceded him in death earlier this year. Hunter was a fourth generation native of Sacramento, CA, son of the late Paul Eyerly Hunter and Ramona Haley Hunter. Following his 1945 graduation from McClatchy High School, where he was cadet battalion commander of the Junior ROTC battalion, he volunteered for the U.S. Army and was in training as an Infantry rifleman when World War II hostilities ended. Subsequently, he graduated from the Infantry Officer Candidate School at Fort Benning, GA. As an Infantry officer he served with the First Cavalry Division in Japan, the First Infantry Division in Germany, and the Sixth Infantry Division at Fort Ord, CA. Of particular importance was his three years with the elite 26th Infantry Regiment “Blue Spaders” of the First Infantry Division, “The Big Red One”, in Germany. He always considered this his true “rite of passage” as a soldier. During the Korean War, following his graduation from Army Language School (Japanese), he served as an intelligence officer (Captain) attached to the First Marine Division during combat in Korea. Following the 1953 cease fire he commanded an intelligence unit involved in Operation “Big Switch”. He was decorated with the Bronze Star Medal for his service in Korea. Upon his return from Korea he attended the Advanced Infantry Officers Course at Fort Benning where he met his future bride, Mary Nell Hale of Columbus, GA. Following his graduation, they were married in the Fort Benning post chapel in 1955 and moved to Baltimore, MD where Hunter attended the Field Operations Intelligence Course at the Army Intelligence School. Upon graduation from the Intelligence School, Hunter was assigned to U.S. Army Command, Reconnaissance Activities, Pacific in Japan. A few months later, Mary joined him. During this three year assignment, Hunter earned his B.S, degree in Military Science at the Tokyo campus of the University of Maryland. Following their return to the U.S., Hunter was assigned to the Infantry School faculty as a Combat Intelligence instructor. During this three year assignment he was promoted to Major and was assigned to Headquarters U.S. Army, Europe (USAREUR) in Heidelberg, Germany where he was Deputy Chief of the Current Intelligence & Indications Center as well as the USAREUR Intelligence Briefing Officer. While in Heidelberg, Hunter was promoted to Lieutenant Colonel and obtained his M.A. degree in International Relations at the Heidelberg campus of Boston University. Hunter’s final military active duty assignment was to the Defense Intelligence Agency (DIA) at the Pentagon. During these six years, he served in the Directorate of Collection, as a course director at the Defense Intelligence School, and following his promotion to Colonel, in the office of the Assistant Chief of Staff, Plans & Programs. He was awarded the Legion of Merit Medal for his service with DIA during the Vietnam War era. Following his retirement from active military service the Hunter family, now including daughter Ramona, moved to Athens, GA where Hunter began his studies toward a Ph.D. degree in Political Science at the University of Georgia (UGA). Upon obtaining his Ph.D., Hunter remained at UGA as adjunct faculty teaching in the Honors Program during his final ten years and in 1989 was named “Outstanding Honors Professor”. In 1991, during commemoration of the fiftieth year since the establishment of the Infantry Officer Candidate School at Fort Benning, Hunter was inducted into the Infantry Officer Candidate Hall of Fame. Dave Hunter was an avid reader and a frequent writer of letters and articles which appeared in both local and national publications. He also traveled the country with Mary, enjoyed his monthly poker group, and was a passionate golfer. He was a lifetime member and president of the late Creekside/Green Hills Country Club and afterwards was a member of Lane Creek Golf Club, where he continued to play with his golf buddies until 2016. During the last few years, Dave (aka “Grandpa”) cared for Mary and enjoyed visits with his loving daughter and grandkids. He continued to cheer on his favorite teams (GA Bulldogs and ATL Braves) and spend time with his friends as much as possible. He will always be remembered for his kindness, patience, loyalty, sense of humor, and positive attitude. With no regrets, he had 91 years of a life well lived. Visitation with family will be November 25th, 2018 (Sunday after Thanksgiving) from 3-6 pm at Lord & Stephens (East Athens). In lieu of flowers, memorial contributions are encouraged to: The USO, PO BOX 96860, Washington, DC 20077-7677; or, The Scholarship Fund Military Officers Association of America (MOAA), PO BOX 320910, Alexandria, VA 22320-9803.